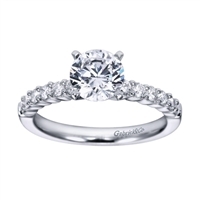 A simple and clever solitaire engagement ring showcases a round center diamond with a criss cross band to add to the mystery of this diamond engagement ring. 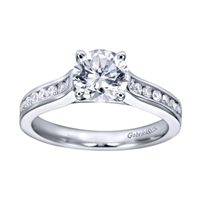 This modern twisted diamond engagement ring made for a round center diamond is set up by round diamond accents along the twisted and sleek white gold or platinum band in this contemporary criss cross diamond engagement ring. 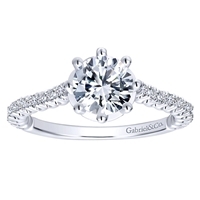 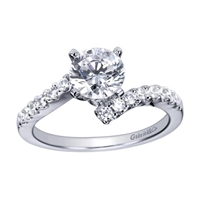 Modern and Stunning Diamond Engagement Ring by Gabriel & Co.
A contemprary straight engagement ring with round brilliant diamonds await a perfect compliment--a round center diamond of your choice. 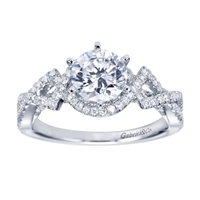 A scintillating combination of round diamonds and white gold form this contemporary straight engagement ring. 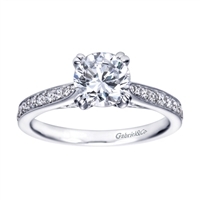 Gabriel and Co. delivers yet again with this contemporary straight engagement ring with a quarter carats in diamonds. 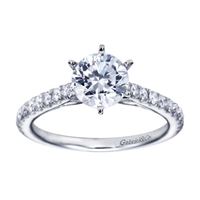 A simple yet stunning contemporary straight engagement ring with 1/3 carats in round brilliant diamonds and a flair for the dramatic. 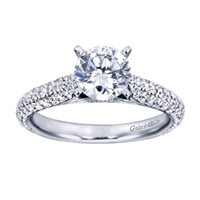 Beaded bands of white gold or platinum gracefully weave their way around her finger with round brilliant diamonds and a round center diamond of your choice in this contemporary bypass engagement ring. 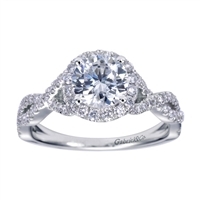 Most won't be able to resist a double take at this unique two tone contemporary halo engagement ring complete with one quarter carats of side round brilliant diamonds. 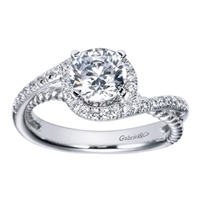 A brilliant and unique design in two tone 14k or 18k gold with round brilliant diamonds and made for a round center diamond. 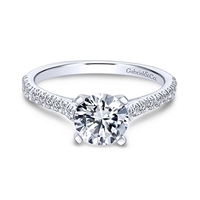 Sophisticated and elegant, this contemporary straight engagement ring with round brilliant diamonds sets up a round center diamond wonderfully. 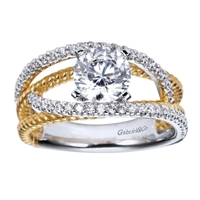 Two tone bands of 14k or 18k gold interweave and intertwine to form this artistic two tone contemporary free form engagement ring. 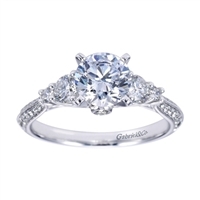 Over half a carat of diamonds and 14k white gold form this contemporary engagement ring. 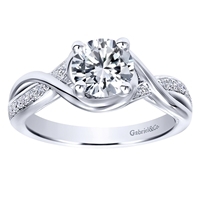 Criss Cross Swirl Engagement Ring A 14k white gold 3 stone diamond engagement ring with round center stone by Gabriel & Co.
Diamond Basket Halo a 14k white gold diamond engagement ring with 76 round brilliant diamonds weighing a total of 0.60 carats in total diamond weight. 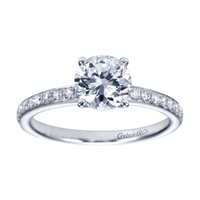 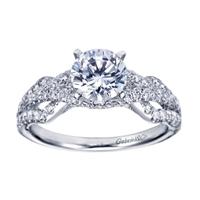 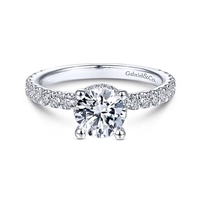 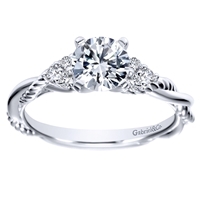 A beautiful white gold contemporary straight white gold band diamond engagement ring by Gabriel and Co.